A feline companion can bring much joy into a home, tranquillity paired with playful tendencies make a cat a great addition to any household. Paws and Claws aim to arrange Cat Insurance that will help you safeguard your four legged family member inside the home as well as out. We want to know that your cat is well protected if the worst were to happen. We offer a range of Cat Insurance products to allow you to select a cover level that meets your requirements and your budget without the need for compromise. From just £4.55 a month, we can arrange a policy for you with a range of additional benefits and you could also be entitled to receive up to a 10% discount on each additional pet if you insure multiple pets with us. Our four legged family members can’t tell us when something is wrong and with only personality and physical changes as symptoms, it can be worrying for owners when their cat or cat looks under the weather. So if you have an ongoing concern or a query about a new symptom, then our Vet team is here to help. Just give us a call on 0333 332 6420 anytime. 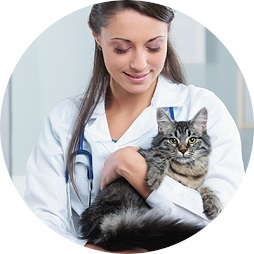 We want to work with you to keep your cat healthy and above all happy.